Manda Bay is on one of the many unspoilt, idyllic islands within the Lamu archipelago, situated on the northwestern tip of Manda Island. The lodge lies in the calm inshore waters on a long sandy protected beach. Surrounded by miles of palm fringed silky sandy beaches and intriguing creeks, Manda Bay is the perfect getaway retreat. There are 22 cottages (11 beach front, 5 sea view and 6 garden view) flawlessly-designed and in keeping with local landscape. Each cottage has a large ceiling fan and refreshing showers inside the en-suite bathrooms. They also have their own verandahs. The cuisine at Manda Bay naturally features a marine flavour, freshly-caught tuna, mangrove crab and prawns are a Manda Bay delicacy! There is a large dining room but on most nights dinners are taken outside under the stars. Manda Bay offers guests a chance to relax and unwind from the pressures of the real world, but for the more adventurous the variety of activities is abundant. Guests can choose from deep sea fishing, windsurfing, laser sailing, mangrove trips, cultural visits, kayaking, waterskiing and scuba diving to name a few. With regular sightings of dolphins, turtles and the occasional Humpback whale the marine life excels. Guests can enjoy safe snorkelling in the warm, gentle and clear waters. Spa treatments and massages are also offered, and there is a gorgeous swimming pool. Game drives and scenic flights are also offered and the lodge has its own airstrip. There is a network of tracks and roads through the acacia woodland and sightings have included bushbuck, buffalo, mongoose, porcupine and dik dik. Bushbabies and genets are often seen around the lodge at night. Open: Manda Bay is open all year. Location: Manda Bay is on the northernmost peninsula of Manda Island. It is a 20 minute boat ride from Lamu town. There are also flights from Lamu to the landing strip on Manda, just 2 minutes from the lodge. Rooms: Bedrooms are built in the traditional local style with thatched roofs. There are 11 beachfront, 5 sea view and 6 garden rooms. Facilities include ceiling fans, en-suite bathrooms, mosquito nets, safe, hair dryer and verandas. Rooms have 24 hour electricity and plugs for charging phones and camera batteries. The accommodation is flexible and can accommodate families and groups of friends. Activities Water-based activities include swimming, snorkelling, sailing (the lodge has Toppers and Lasers), windsurfing, kayaking in the mangroves, fishing and dhow cruises. Motorised watersports like waterskiing and kitesurfing can be arranged at an additional cost. The lodge can arrange guided walks where you may see birds, mongooses, civet cats, porcupines, dik-dik, bush buck and buffalo. In October you can see Humpback Whales and dolphins can be seen from December to March. Facilities: The lodge has a nice beach. There is an infinity swimming pool and daybeds, loungers and hammocks. You can escape the heat of the day in the thatched sitting room and bar or in the games room. There is a boutique selling local crafts, carvings, jewellery, and kikoys. The lodge has a reading room with a selection of books and magazines and views of the bay and gardens. Food includes fresh seafood, fruit, salads and vegetables. Breakfast is a buffet, lunch a light meal and dinner is a 3-course meal. Meals can be enjoyed in the dining room, by the pool or on Utamaduni, the 60 foot sailing ship or on the beach beneath the stars. Sundowners are served at the top of a sand dune above the lodge. Dining: Meals are taken at individual tables, or as a group if you wish. Health: This is a malaria free area. Communication: There is internet access. The signal is stronger in the bar and dining area than the rooms. Mobile phone signal is available. The lodge supports a small school on Manda Island which has up to 70 children. It has suffered from a lack of funds from the government and local administration so as part of the lodges' contribution to the community they are helping with construction and funding. One of the projects has been to get the guttering and water tanks useable to collect rain water during the wet season, they are also building an admin block and modifying some classrooms. Manda Bay has also been researching and drawing up a proposal for a mobile boat clinic to help local villagers. "Manda Bay is fabulous and has a lovely white sandy beach at low tide. The rooms are fabulous - same in style as the other beach lodges around Lamu but with lots of luxurious attention to detail. 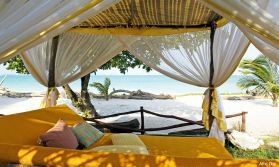 The only thing I'd say look out for is if you want to go to Lamu town or out and about on excursions, Manda Bay is a long way from anywhere so you'll end up spending loads on transfers. The food was lovely, but dinner was served very late - maybe that was just a one off!"